The ancient Sangam literature (first-fourth centuries a.d.) of the Tamils makes numerous references to the elephant's fondness of bark. There is also an interesting observation that a pregnant elephant would abort its fetus if it fed on the young shoots of bamboo, one of the earliest references to a plant toxin (today, it is known that growing shoots of many plants may be protected from herbivory through the production of cyanogenic compounds). Most modern-day elephant observers in Africa and in Asia have commented on the diversity of plants in the diets of the two species. A unique organ, the trunk, makes it possible for the elephant to delicately pluck the tiny inflorescence of a touch-me-not (Mimosa pudica) herb or bring crashing down the stout branch of a large Acacia tree. The elephant's diet includes short and tall grasses, forbs, aquatic plants, leaves and twigs of several shrubs, trees and lianas, fruits, bark, roots, and the pith of baobabs and bananas (fig. 5.1). There are several figures in the literature on the number of plant species consumed by elephant populations in various habitats. These can be looked at broadly in dry habitats, such as savannas and woodlands, or in moist habitats, such as rain forests. One of the earliest scientific studies of feeding in elephants was in the savanna habitat of Uganda. Examination of stomach contents, reported by Irven Buss in 1961, revealed 25 plant species in the diet of these elephants. Similar examination of culled elephants during 1971-1972 at Wan-kie (Hwange) in Zimbabwe by B. R. Williamson identified 61 browse species. Direct observations of elephant feeding have turned in even higher species numbers. Peter Guy, on foot, followed elephants at the Sengwa Reserve in Zimbabwe during 1973 to record their feeding habits. 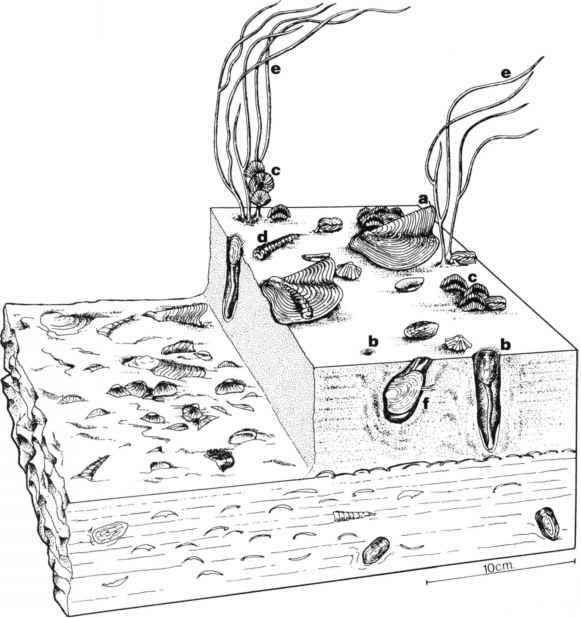 His records, which covered all the major seasons in this dry woodland region, included 133 species of plants belonging to 95 genera and 41 families. George McKay, who studied the elephant in Sri Lanka (Ceylon), reported in 1973 that its diet in dry thorn forest and grassland comprised at least 88 species of plants, including trees, shrubs, vines, and herbs. 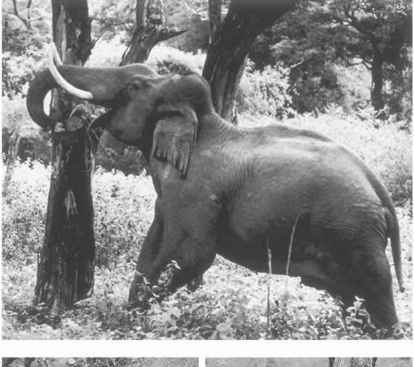 My own observations of a southern Indian population of elephants during 1981-1983 in deciduous and thorn forest showed at least 112 food species, with the bulk of the diet comprised of plants from about 25 species belonging to five botanical groups—grasses, sedges, palms, legumes, and malvaceous shrubs and trees. There are fewer studies of elephant feeding in moist forests; these have usually relied on indirect evidence of feeding, such as plant components in dung (fig. 5.2). Two studies on the African forest elephant in Ivory Coast's rain forests during the late 1970s brought out the importance of fruits in the diet. G. Merz noted that seeds constituted up to 35% of the dry weight of elephant droppings during the fruiting season, which was December to February. As many as 29 species of fruits were recorded during a single month. D.-Y. Alexandre identified a total of 37 fruits in elephant droppings. A few of these dominated the elephant's diet seasonally, with seeds from only 2 species making up half the weight of droppings. Another study by J. Short of the diet of forest elephants in moist evergreen and semideciduous forests of Ghana recorded 35 species of fruit consumed with traces in 93% of elephant droppings examined. More recently, Lee White and colleagues recorded the fruit of 72 species in the diet of forest elephants in Gabon. Remains of at least 1 fruit species were found in 82% of dung samples. Most fruit species, however, were recorded only over 1 month, indicating that the elephants were consuming whatever was available seasonally. Overall, the elephants of Lope Reserve consumed various parts of at least 230 plant species. 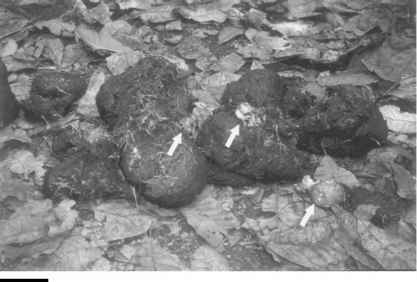 Remains of fruit (arrows) in the dung of elephant. Dispersal by elephants may be important for some species of trees, especially in rain forest. all of these, but the point to emphasize here is the diversity of an elephant's diet. Certain plant families consistently appear as providing much of the elephant's diet in both the continents. These are Poaceae (or Graminae—the grass family), Cyperaceae (the sedge family), Palmae (the palm family), Fabaceae (or Leguminosae—the legume family), Euphorbiaceae (the spurge family), Combretaceae (the combretum family), Rhamnaceae (the buckthorn family), Anacardiaceae (the cashew family), Moraceae (the mulberry family, which includes the figs), and the botanical order Malvales, comprising Malvaceae (the mallow family), Sterculiaceae (the sterculia family), and Tiliaceae (the basswood family). 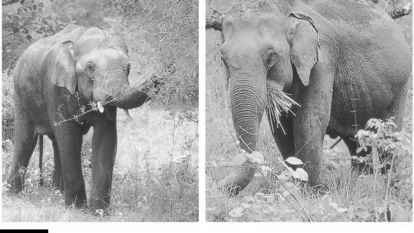 The elephant is also a versatile feeder when it comes to handling different plant parts. From the grasses, not only are the leaves consumed, but also the entire clumps are uprooted, and the succulent basal portion is eaten along with the roots (after cleaning them of mud by thrashing against the front feet or even immersing in water). From bamboo clumps, the lateral shoots with leaves are commonly taken, but entire culms are sometimes split and eaten. Small herbaceous plants are consumed whole. Taking foliage from shrubs and trees is the most common way of browsing. The same plants may also provide other sources of nourishment, such as bark and fruits. From acacias, for instance, the leaves, bark, and fruits are often consumed. The short, hooked thorns or long spines on acacia branches do not deter elephants from taking them entirely. Although fresh foliage is preferred when elephants browse, they still consume dry branches and twigs when the need arises, such as during the dry months. From many other shrubs and trees, such as the malvaceous plants, only the bark is consumed, and any leaf taken in is largely incidental. The growing central rachis is pulled from palms, often killing the plant. Short palms are also dug and pulled out to consume the basal portion of the stem and the root. Smaller fruits are consumed whole, while larger ones such, as the jackfruit, are first crushed under the foot. The consumption of fruits is obviously seasonal. Elephants may spend long periods of time at a particular tree or a cluster of trees, literally gorging themselves with ripe fruit. They may even get drunk if these happen to be fruits, such as from certain palms, that ferment. The stem of a baobab is gouged out to get at the central succulent pith. Banana stems are likewise split to reach the soft pith. The elephant can also be very selective, spending long periods picking the tiny flowers of favored herbs, such as mimosa. In the variety of plant types and parts consumed, the elephant does not seem to have any equal among terrestrial herbivorous mammals.